The backlash to Pepsi's ad featuring Kendall Jenner will make agencies and marketers nervous, but it should encourage them to embrace diversity, industry executives have said. The soft drink that promised to be the voice of the generation was subject to a wave of protests and was forced to pull its latest campaign. Critics dubbed it the "worst ad ever", while Ash Bendelow, managing director at Brave, warned that it is the ultimate incarnation of "what happens when you work in a bubble". 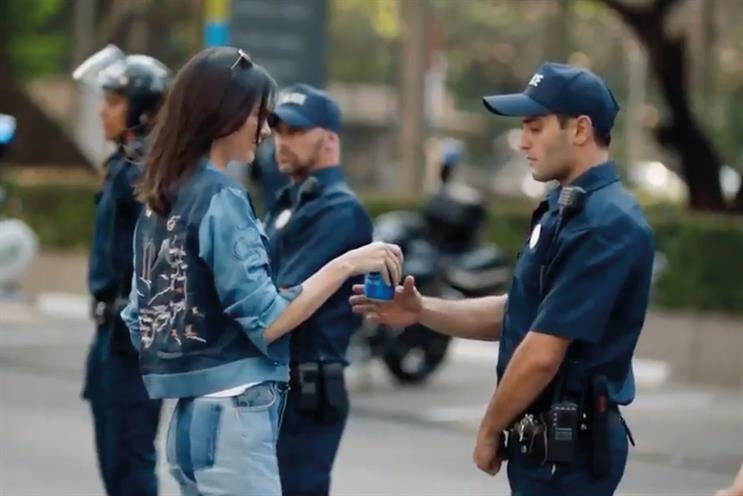 The spot, which controversially borrowed imagery from protest movements such as Black Lives Matter, was made by Pepsi’s in-house arm Creators League Studio. Nene Parsotam, co-founder of Vine Creatives and diversity initiative Stripes, thought the ad comes across as "shallow, inauthentic and contrived". Parsotam said this is partly because Pepsi used one of the "least politically active social media influencers, showing that they chose this celebrity for her reach and popularity as opposed to her views, adding to the feeling of disingenuity which permeates the ad". The negative response will "certainly make the whole industry more nervous and more risk-averse than ever", Chris Pearce, chief executive of TMW Unlimited, added. He said the campaign underlines the danger of starting with advertising as opposed to actually doing something and then communicating that commitment through marketing. However, despite the backlash, experts believe that if there was ever a time for brands and agencies to embrace equality, this is it. "With everything that has been playing out politically and socially, brands need to truly represent our society. This ad falls so far from the mark – so why did no-one pick up on it?" Fiona Scott, chief executive of Psona, asked. Indeed, perhaps the biggest question of all is: how did this film ever see the light of day? Theo Izzard-Brown, head of strategy at McCann London, acknowledged that brands need to be more opinionated and take a stand on social issues. Yet, in an "absolute desire not to offend, the Pepsi ad has become offensive". He said the campaign would likely have been "tested within an inch of its life" and its roll-out could be down to human exhaustion. "Sometimes these things become a war of attrition and you have to wonder how long this campaign was in development," Izzard-Brown explained. "There does come a point where people become so exhausted, they just want to get it over and done with." Jamie Inman, head of strategy at BMB, added that his agency partnered a mobile research company to analyse the public’s attitude to the spot and, on the whole, consumers were fairly neutral about it. In fact, this form of "global blanding" is not uniquely the preserve of in-house teams. Agencies complain that compelling creative ideas can be diluted by process, testing, management restructures and client approvals until the finished product no longer reflects even a glimmer of the promise of the original idea. So perhaps creating a culture in which individuals feel free to express their true feelings is the biggest antidote to the homogenous blandness that enables mediocrity – or, worse, culturally insensitive advertising – to thrive.